Ice Machine Repair Tulsa - All Brands, All Repairs! D&G Mechanical, LLC services commercial food stores all around Tulsa, OK. We are dedicated to providing quality workmanship, professional ice machine repair, and customer satisfaction. For more than 100 years, the Tulsa Regional Chamber has served as an integral part of what makes our community a great place to live, work and play. Every strategy, program and service is created specifically to provide a positive, year-end dividend and we are 100 percent focused on results that translate directly to our customers—our 2,500 members and our community. 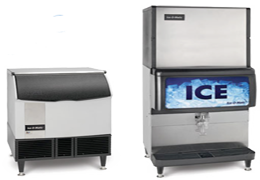 Troubleshooting for ice machines most commonly used in restaurants, hotels & lodging, convenience stores, bars, etc. and other applications. Ice machine troubleshooting is always easier when you have the service manual for the ice machine's manufacturer. Find below a list of the most popular ice machines used. You need to verify that the water supply to the ice machine is good, and you should also inspect the ice machine water distribution components. If they're plugged with scale build up, the ice machine should be descaled, but make sure the ice machine at least runs and starts freezing normally first. Note: If there are major problems with the compressor, metering device, controls, etc., and the machine is too old and needs to be replaced instead of paying for major repairs on, the descaling procedure might turn out to be a waste of time. You'll also want to take a close look at the evaporator plate. If the ice machine plating is severely discolored, or if you see a lot of copper color showing through, the plating might be worn off to the point where ice won't drop off the evaporator during harvest. You also want to be sure there's no scale build up on the ice machine's evaporator. Check the ice machine's condenser and make sure it's clean, make sure the condenser fan blade turns, and verify that nothing is interfering with the airflow through the condenser. If it's a water-cooled condenser, verify that there is water pressure available to flow through the condenser when the unit runs. If you have refrigerant gauges, attach them and make sure there's pressure in the machine; and if you can, verify that it's the correct refrigerant. If there's nothing else visibly wrong with the ice machine, turn on the power and verify that it is the correct voltage for the ice machine. If there are solid state controls, see if there are any error code indications, and write down what they are. We'll go over possible ice machine problems and their causes shortly. By this stage, you will have verified that the water and power supplied to the machine are correct, that the condenser is clean and the fan is good. If it's a water-cooled condenser, you'll have verified that there's water available to flow through the condenser, and you'll have verified that the evaporator plate and water distribution components are clean and scale free. If there are no error indications, or if the machine doesn't have solid state controls, turn the machine on to "ice," and see if it will run. Keep in mind that different makes of ice machines start out differently. Hoshizaki units start by defrosting until the suction line thermistor warms up; Manitowoc's start a couple of different ways, depending on the type of machine; and Ice-O-Matic's also start a couple of different ways, depending on the type of machine. So give the ice machine a couple of minutes to cycle into its full freeze mode. If your ice machine troubleshooting is for a Manitowoc unit, and the water pump runs but the compressor doesn't run, wait at least 10 minutes to see if it drains, re-fills, and starts rinsing again. If it does, someone switched it to "clean," and it won't cycle into "freeze" until it finishes the complete clean cycle. If your ice machine troubleshooting is for a Hoshizaki unit, pay close attention to the strength of the water flow during the fill cycle when it starts up. These units require a strong water flow for optimum harvest efficiency, so if flow looks weak, check the pipe size, filter, inlet screen, and distribution nozzles. The rest of this troubleshooting article will cover common ice machine problems, and what symptoms to look for. First, check the cuber and bin drains for steady running water. If you see this, the dump valve might be leaking, the fill solenoid or float valve might be leaking, the drain siphon pipe might be loose or adjusted incorrectly, or the sump pan or the machine might not be level. This will cause long ice machine harvest cycles, can trip the solid state controls on "long cycle time" errors, and will increase the cost of making the ice. If your ice machine troubleshooting is for a machine that immediately trips off on high pressure, put your gauges on and verify that the pressures are actually high and that the safety hasn't failed. If the pressures stay normal but the high pressure safety opens, the safety has failed and you need to replace it. If the pressures are high, verify that there are no isolation or service valves closed on the high side of the system, double-check the condenser coil to see if it's plugged, check to be sure the condenser fan is running and that it's the right size and turns in the right direction, and make sure no other appliances are blowing hot air directly into the condenser coil. If this ice machine troubleshooting is for a water-cooled machine, verify that you have water flow and that it's not hot water, make sure the head pressure regulating valve hasn't gone out of adjustment or totally failed, and if you can, disconnect the water lines and inspect the inside of the condenser for scale or dirt buildup. If there are no mechanical problems that would cause high pressures, it's possible the system is overcharged or contaminated with noncondensables. To check for noncondensables, leave the machine off for a few minutes so pressures will equalize. Check your pressures, and check the temperatures of the evaporator plate and condenser coil. If your saturated temperatures aren't equivalent to these pressures, it's very likely that the system is contaminated. You'll need to recover the charge, replace the drier, evacuate the system, and weigh in the factory specified charge. You don't know who worked on the machine before you did, so you'll want to be sure that you don't leave the ice machine running with an overcharged and possibly contaminated system. OK, what about an ice machine troubleshooting where the machine trips off on the low pressure cutout instead of the high pressure safety? Once again, check the pressures to be sure the suction pressure is actually low enough to trip the cutout. If the cutout opens but the suction pressure hasn't dropped to the cutout point, the cutout has failed and should be replaced. If the suction pressure is lower than normal and you also have low discharge pressure, suspect a low charge and check for a leak. If you find a leak, make the appropriate repairs. If you don't find a leak during this stage of troubleshooting, charge in two to four ounces of refrigerant to see if your suction pressure increases. On large machines you may need to charge in a little more to see an increase in suction pressure. If suction pressure and discharge pressure increase, it's very likely an undercharge; so you need to find out how the charge was lost if possible, make the appropriate repairs, then charge in the factory specified amount of refrigerant. If you suspect a leak and absolutely can't find it, charge in enough refrigerant to get the machine to make ice, charge in the correct amount of fluorescent leak detection dye, leave the machine running and making ice, and make plans to come back and find the leak in a day or two. Return in a couple of days and, using an ultraviolet light, you should be able to locate the leak. Make the appropriate repairs, and get the ice machine up and running. What about a similar ice machine troubleshooting with the machine tripping off on low pressure, or running with low suction pressure, but you don't find a leak, and when you charge in refrigerant, the pressures don't rise? First, check for a restricted drier or liquid line. If the drier is restricted, the outlet will be several degrees cooler that the inlet, and the drier itself might even be sweating or frosting. If the liquid line is restricted, you might see frost or condensation at the location of the restriction, and the outlet side of the restriction will be cooler than the inlet side. If the drier and liquid line aren't restricted, check for a restricted or failed metering device. If the metering device is a capillary tube, you might have to strip off some insulation, but if it's restricted you'll see a spot of frost at the restriction. If the metering device is a TXV, and if you're sure the ice machine is fully charged and the evaporator plate is only freezing about half way or maybe even less, then the TXV has failed. After five minutes of the freeze cycle, measure the temperature of the inlet and outlet copper lines of the evaporator. If the temperatures are not within 5Â° of each other, the TXV has failed. If the temperatures are within 5Â° of each other, both TXVs are good. If the temperatures aren't within 5Â° of each other, the TXV with the higher outlet temperature has failed. Keep in mind, this is only one step in the overall ice machine troubleshooting procedure. The next ice machine troubleshooting will be an ice machine that's running, but takes too long to make ice, and is possibly tripping off on "long freeze cycle." You should have already verified that the ice machine's dump valve, fill solenoid, and float valve aren't leaking, that the drain pipe isn't loose or adjusted incorrectly, and that the sump pan and machine are level. If there's no water flow problem, check the temperature of the defrost/hot gas solenoid about five minutes after the freeze cycle starts. The inlet will be hot, but the body and outlet should be cool enough to hold. If the body and outlet are too hot to hold, it's probably leaking, which will increase freeze cycle times. During your ice machine troubleshooting, you should keep an eye on your gauges, and take notes on what's happening. Are pressures normal? If you have a high discharge pressure, check the condenser, and check for noncondensables. What's happening with the ice machine's suction pressure? A few minutes after starting the freeze cycle, the suction pressure and head pressure should both start gradually dropping until the machine harvests. If pressures start out normal, and the ice machine starts making ice with a good fill pattern on the evaporator, but suction pressure doesn't drop and the ice takes way too long to build up, it's possible that the TXV has failed and no longer responds to superheat changes. Verify that the ice machine's bulb is strapped securely to the suction line, and that the contact between them is clean. Use the TXV troubleshooting method described earlier in this article. If you replace the TXV, make sure the replacement is an exact match for the capacity and operating range of the ice machine. I'd recommend using factory replacement parts. Let's say we're on this ice machine troubleshooting and there's no water flow problem, discharge pressures aren't too high, it doesn't look like the TXV has failed, and the pressures look very close to normal. What does the ice pattern on the evaporator look like? Is the ice thickness good all the way up the evaporator? Or is the ice thin on the last few rows of the plate? Charge in two to four ounces of refrigerant and see if the ice now builds the rest of the way up the evaporator. If it does, the problem was a low charge, which can cause long cycle times. Find the leak and make the appropriate repairs. Other possible causes of long cycle times are hot supply water, hot condenser water, an air cooled condenser recirculating its own air, ice thickness control set too thick or failed, too much water flowing into the sump, failed harvest pressure regulating valve, inefficient compressor, or someone might have installed the wrong compressor or TXV. What about an ice machine troubleshooting where the machine makes ice, but it won't drop off the evaporator during harvest? You should have already verified that there's no scale build up on the evaporator, and that the plating looks good. The service manual will be a lot of help. It will tell you what the pressures should be during both the freeze and harvest cycles. If your pressures are good during the freeze cycle, but not as high as the factory specifies during harvest, check for a low charge, restricted hot gas solenoid, or inefficient compressor. Once again, the manual for your specific ice machine will give you more detailed guidance on how to troubleshoot it. If harvest pressures are normal, but the ice doesn't drop off the plate, the evaporator plate is clean and scale free, and the ice machine is level, there's a strong possibility the plating has worn off the evaporator, which will make the ice stick even during harvest. Pull the curtain off and take a close look at the ice slab during harvest. If you can look through the ice slab and see the water running down between the slab and evaporator, but the ice simply sticks on the evaporator and doesn't drop off, the plating is gone, and the evaporator has to be replaced. On a Hoshizaki ice machine, you don't have to worry about plating because they all have stainless evaporators. But if ice seems to drop off the evaporator too slowly, and harvest pressures are good, check for strong water flow into the machine during harvest, and make sure the water distribution nozzles are clear. There are separate sets of nozzles in some Hoshizaki ice machines, so during the harvest cycle be sure there's good water flow through the nozzles that fill down between the plates. This water flow helps warm up the plate during harvest. Ice machine troubleshooting when there's power to the machine, and overall it looks in good enough condition to run, but when you turn it on to make ice, nothing happens. Again, check for any LED error indicators, and troubleshoot according to the schematic and legend on the ice machine. Check for a high pressure switch that needs to be manually reset. If you find one tripped, use the method described earlier in this article to determine why it tripped. It could be a magnetic switch on the water curtain, a thermal element that opens when ice in the bin cools it down to its set point, an infrared beam and sensor assembly, a push-rod that the curtain activates, or a lever that the curtain activates. If you find that there's no water in the sump, and if it's a machine that cycles on a float switch or water level sensor, verify that the fill solenoid is energized. If the top of the armature doesn't feel magnetized, check for voltage at the leads to the coil. If the voltage to the coil is correct but it isn't energizing, the coil has failed and needs to be replaced. If the ice machine's fill solenoid is energizing, but no water is getting into the machine. Crack open the inlet fitting to the fill solenoid to see if there's good pressure available, then crack open the outlet. If there's water pressure on the inlet side but not on the outlet side, the solenoid is restricted and needs to be cleaned or replaced. If there's no pressure even on the inlet side, you need to check the water supply to the ice machine. After you take care of the water problem, the sump should fill to the point where it satisfies the float switch or level sensor, then the ice machine should cycle into freeze. If the ice machine doesn't cycle into freeze when the float switch lifts or when the water reaches the level sensor, you'll need to check the operation of the float switch assembly or level sensor. The problem might be dirt, sludge, or scale buildup, or the part has failed. Whether or not the ice machine cycles into freeze at this stage of the call, keep an eye on the fill water flow and make sure it stops. Some ice machines will continue to fill a little more water after the machine cycles into freeze, but if the ice machine continues filling to the point where you have a steady drain out of the sump, check the fill solenoid. If it's de-energized but fill water is still flowing, it's probably being held open by some debris, and you'll need to disassemble the valve and clean it out. If you don't find any of the previous possible problems, check the ice machine's wiring and connections for a loose connection or broken wire, and check for a blown control fuse or a failed relay, contactor, or time delay. You might even have to trace through the controls wire by wire to see if a control wire is connected to the wrong place. Refer to the service manual for the machine will save you a lot of time and frustration. What about an ice machine where the machine turns on, the water pump runs, and water is flowing over the evaporator, but the compressor doesn't run? First, if you hear the compressor humming and tripping off on its overload, turn the power off. Remove the leads from the compressor terminals, and ohm out the compressor windings. If the windings ohm out OK with no indications to ground, the next thing to do is make sure the leads aren't grounded or shorted to anything, then turn on power and verify that there's good power at the compressor leads. If there's good power at the leads, replace the start relay, start capacitor, run capacitor, and external overload (if installed), reconnect the leads to the compressor, and turn the machine on and see if the compressor will run. If you have good voltage at the compressor, and new start components, but the compressor simply won't run, but just hums and trips the overload, you can be pretty sure the compressor is locked up and has to be replaced. Verify that the ice machine's contactor has pulled in. If you don't have control voltage at the coil, you need to trace back through the circuit to see if there's an open safety, broken or loose wire or terminal connection, or a failed control relay. If the contactor has pulled in, check the voltage on both the line side and load side, and check across the contacts to see if one set has failed and isn't conducting. If you have good voltage on the load side of the contactor, check the voltage at the compressor terminals and start relay. If you don't have good voltage at the compressor terminals and start relay, look for a broken or loose wire or terminal connection. If you have good voltage at the start relay and compressor terminals, ohm out the compressor windings (and external overload if installed). If the Ice Machine's compressor is three phase, or single phase with a potential start relay arrangement, you'll have already found the failed part. If this is a small ice machine compressor with a current relay and external overload, and the windings ohm out OK with no indications to ground, you'll probably find that either the overload has failed open, or the current relay has failed. If you replace the failed part, the compressor will probably run, and I'd recommend replacing all three parts. That about covers the most common ice machine troubleshooting. As you've learned from this article, there is a tremendous amount of potential problems to assess during the ice machine troubleshooting process. Along with the many potential ice machine issues, there are also many, many safety concerns when working with any of the electrical components. All of this being known and understood, it is highly recommended to call a qualified refrigeration technician perform these troubleshooting procedures to ensure fast, proper repairs. D&G Mechanical, LLC has many years of Ice Machine Troubleshooting experience. Call us Today for Available Same Day Service to All of Tulsa, OK.